TVNEWS4U.COM is delighted to introduce a very special new series. Built upon the knowledge, experience and learning of established professional leaders. Through Contributions. Conversations. Discussions. To help young aspiring professionals and students of Marketing, Media, Advertising and Entertainment alike. 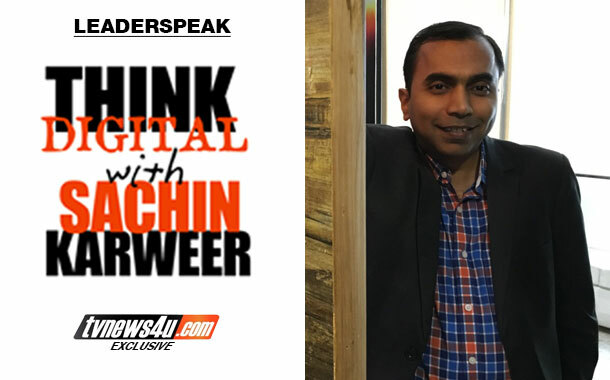 We are pleased to begin Leaderspeak with TVNEWS4U LEADERSPEAK: Think Digital With Sachin Karweer. Sachin Karweer is Business Head – Hinduja Global Solutions Interactive, and a young veteran in Digital Marketing. He will write about the Digital Marketing space, from the knowledge, skills, experience and effectiveness perspectives. This column will offer insights into trends and specific developments, and their impact on the industry and the business of marketing a company or its offerings to the millions of people who are so active on digital, online and social media today. Whether you are into traditional or digital marketing, we welcome you to ride the digital wave and Think Digital With Sachin Karweer. Every week. Your in-house Digital Marketing program. For understanding, perspective, practice. I remember the days when marketing meant distributing pamphlets, print ads, TVCs and billboards. Brands had little choice and the struggle was real. Thankfully, those days are long gone, and in today’s digital landscape, if you are at point A as a brand and wish to reach point B, you can do so easily and effectively through digital means, in spite of the massive clutter in traditional marketing and the cacophony of noise in conversations, real and triggered, in social and digital. Today, digital media is omnipresent; eating up and complementing print, television, and every other kind of content creation and consumption. Digital is a crucial part of the marketing arena and it serves to complement the bigger picture effectively. This phenomenon has gained importance over the last few years, and for good reason. There is a need for everything to be digitally connected. From the voting system, to specific information like real-time schedule of public transport, to real-time stock availability in physical stores, along with news-you-can-use kind of analyses, the internet is not just a very convenient source of all kinds of information, but, thanks to the infiltration of digital in every sphere of our lives, it has also become very measurable. Hence making the marketer accountable in a very precise and no-nonsense way. Why Digital Marketing? I’ll say this only once, and that because it’s the start of these conversations, but you know the size and scale of the internet. The numbers of users and audiences across digital, and the size and rate at which the industry has been growing. The FICCI-KPMG Report 2016 says the Indian Media & Entertainment industry is expected to grow at a CAGR of 14.3 % to INR 2,260 billion by 2020, with advertising revenues expected to go up to INR 994 billion at a CAGR of 15.9 %. Digital advertisement spends outperformed expectations in 2015, growing almost 38.2 % over 2014 to reach INR 60 billion. It is expected to cross INR 255 billion in 2020. The world has a total population of 7.4 billion. 3.42 billion internet users, equaling 46% global penetration; 2.31 billion social media users, delivering 31% global penetration; 3.79 billion unique mobile users, representing 51% global penetration and 1.97 billion mobile social media users, equating to 27% global penetration. A study of 30 key world economies that account for 70% of the world’s population shows that nearly three-quarters of internet users access the net every single day, and that number is growing at an impressive rate. Hence Digital Marketing. With the digital revolution, there is a shift in the balance of power that has disrupted the traditionally path of buying. Being digitally-empowered, consumers these days have a voice and they wish to be heard. They have the ability to influence not just what they buy but also what others around them buy. They have the power to dictate and shape the products they consume. It is also important for a brand to do everything it can to protect itself in the digital landscape. With the opportunities that social media offers come threats for brands. We know what happens when a brand gets its 15 minutes of fame on social media, but for the wrong reasons. The American fast-food restaurant chain Taco Bell went through a social media crisis when a video of rats running around its store in New York was released on YouTube. Just minutes after, duplicates and new versions were circulated – all, watched approximately 2 million times. Customers raised concerns about the cleanliness of the restaurants, affecting its stock price and sales across 7000 franchisees’. In India, Air India’s online crisis management is the ideal example of what not to do. Air India went through turbulent times with its clumsy handling of a response to a viral video showing a passenger, due to take her exam the following day, pleading with Air India staffers to allow her to board the flight as she was five minutes late. That video has fetched more than 1.3 million views on Facebook and the Facebook post has been shared more than 50,000 times. These cases just go to show how crucial online reputation management is. With both, competitors and potential customers constantly online, brands and businesses need to explore how they can improve every element of their brand to add to its reputation. Needless to say, having effective digital marketing activities in place is the only way to stay ahead in this race. Having a strategic plan is crucial; without a well-planned and sound digital strategy in place, even in an environment that has no negative conversations going about your brand, it’s easy to lose track of potential leads and the opportunities to grow and go viral. It is no secret that companies that get it right get more customers. As with every kind of strategy, digital strategies too need to be made with well-defined objectives and outcomes. A digital marketing strategy can help you deliver on numbers. Wars aren’t won without planning; similarly, you need a digital strategy in place before starting any marketing activities online to attract the attention of, engage with and captivate your audience. Having an integrated digital strategy in hand will make sure that all your digital marketing efforts are streamlined. Since the internet has seeped into every possible aspect of our lives, it is imperative that you stay ahead or catch up with your competitors. Lipton Ice Tea was the first to launch a summer-themed campaign celebrating the bright shades of the season. It showcased attractive GIFs and videos, sharing recipes of summer coolers like Citrus Punch, Pina Colada, and Mojito. The campaign used another hashtag and kept viewers updated with the on-going cricket World Cup and the popular superhero movie Batman vs. Superman. The campaign worked well in their favour as it satisfied the young audience and incorporated current themes. No matter how good your communication is, it will go to waste if your audience do not understand it or do not relate to it. One of the most common mistakes made in the digital realm today is forgetting who your core audience is. A clearly defined digital strategy will take into account the important task of understanding your audience, how you can make use of each channel and touch points, and what message needs to be communicated to your potential consumers. You have to mould your communication to fit your audience and not the other way around. Once you know who your audience is, interacting and providing them with proper engagement points can give you an insight into what they actually want. Once you deliver on what you promise, you will be able to build better relationship with your targeted audience. Let’s take a look at Fastrack, who launched a micro-site through its social media channels and shared a series of quirky videos. The micro-site compelled two-way communication and encouraged users to share on Twitter and Facebook. The campaign garnered more than 1.5k to 2k views on its Facebook pages and the interactive microsite also garnered huge numbers for each video. This campaign shows the successful marriage of a brand with its audience using the right channels. The days when only multinationals and large companies could afford to launch a digital marketing campaign are long gone. Whether you’re offering is small, medium or large, the digital domain provides a powerful platform and wonderful chance for each brand, irrespective of its size and budget. The ground is fair and open to all and it’s up to you to compete and attract its share of targeted traffic. Data is what needs to be at the heart of all the decisions you take on digital marketing. It is only with constant analysis and metrics; you can keep track of your key activities of strategy development and implementation. With post campaign analysis, you can also gauge what works, what doesn’t and adjust your marketing, accordingly. This will help your brand develop an in-depth knowledge of its business. In the hands of an experienced professional who knows what to look for, you will know your next step and what logical sequence to follow. With constant competition come threats. You need to differentiate yourself from your competitors and know your true value. Your digital strategy can articulately communicate it to your audience while lack of it can make it impossible for you to tackle threats effectively. Brands can learn a lesson or two from Xbox’s compliments to its rival Sony on the latter’s launch of PlayStation 4. Xbox joined the Twitter discussion on the launch day and earned brownie points from the viewers. An integrated digital marketing campaign is proven to deliver a higher ROI. Though brands are reluctant to invest in the digital medium, it is a fact that it helps understand the larger picture and stay afloat. As per Google, brands that use digital marketing strategies have 2.8 times better revenue growth expectancy. Take a look at these brands who achieved a higher ROI with their creative campaigns. Snickers’ misspelling search keyword campaign to reach out to bad typers reached 50k people in 3 days. The Click-through-rate (CTR) was an impressive 1.05 percent, bringing in 5,874 visitors to their website. The “Share a Coke” social campaign by Coca Cola printed common names and other nicknames on its bottles while encouraging consumers to share their drinks on social media. In Australia, where the campaign originated, Coca-Cola increased its sales volume by 4 percent in a down market, and consumption among young adults increased by 7 percent. Understand that digital marketing is not about the battle between digital and traditional approaches. It can exist in harmony to yield better results in a cohesive manner. Small businesses have very little resources and capitalization. Digital marketing provides a cost-effective marketing channel and generates positive results. Blendtec, a small-budget company selling professional and home blenders, caught the attention of people with the “Will It Blend” campaign using entertaining videos. The videos went viral with more than 300 million people watching it. The brand became popular overnight and the videos boosted sales fivefold. Time is invaluable in the digital world. Every aspect of your digital activity can be tracked and managed to ensure that precious time is not wasted. Once you have the information in place and the means to interpret it, you will be able to see that digital marketing is working to your advantage and ensuring survival for your business. Last but not the least, armed with a digital strategy, you can have focus and direction to stay in control. Technology is a means to an end, but if you don’t consider that the people and process are precious before you choose the technology, be prepared for disappointing results. With expert help at hand, you can perform in the digital world like a game changer.